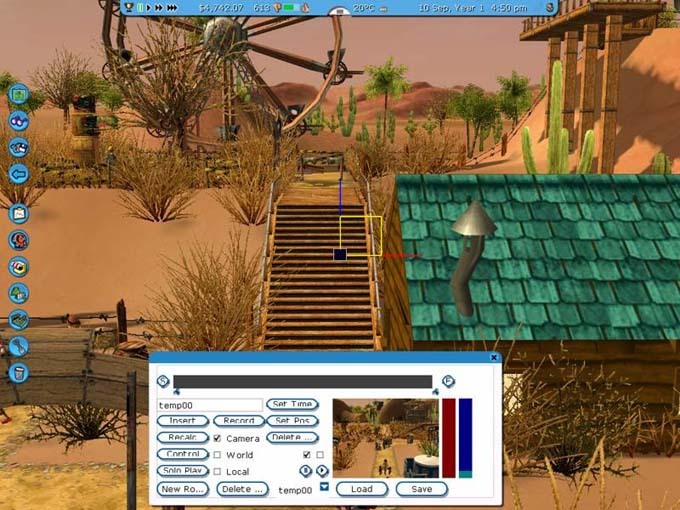 While watching Roller Coaster Tycoon 3 videos you may have seen some wonderfully smooth, swinging camera movements. These are often created with the ‘Flying Camera Route Editor’ built into RCT3. You may also hear this referred to as the ‘Attract Sequence Editor’ since that name appeared in the Prima guide. But since the routes you’ll be creating are saved as ‘.fcr’ files, I’m going to stick with the FCR Editor name for this guide. The information in this guide has been tested on the North American retail release of RCT3 complete with second patch. Other versions should work the same way - famous last words. I welcome any additions, corrections, or suggestions for improving this guide. First, a brief aside just to make sure everybody knows about the ‘official’ way of making video clips in RCT3. Anytime you are playing the game you can press the CTRL+SHIFT+F11 key combination to start recording a clip. Press the same keys again to stop. This works when you’re just looking around your park, or when you’re using the CoasterCam to ride your rollercoaster. Yes, the frame-by-frame recording process is slow, but of very good quality. By default, the movies end up in the ‘My Documents\My Videos\RCT3\’ folder. Remember that CTRL+SHIFT+F11 key combo, you’ll need it later. - even simpler, press the CTRL+SHIFT+0 key combination. That’s a ‘zero’, not the letter ‘O’, and it has to be the zero over the ‘P’ key, not the one over on the numeric keypad. This will bring up a mostly blank FCR Editor window. To see the rest of the Editor’s controls, let’s start a new route. You have probably already discovered that clicking the buttons doesn’t seem to do anything. The trick is to click on the drop shadow under the button. Remember this trick, it be needed for some other buttons later. After clicking the drop shadow under the New Route button you’ll be able to see all of the FCR Editor’s other controls. In the screenshot below I’ve added some labels so we can refer to them in the tutorial. One other bit of terminology to get out of the way. 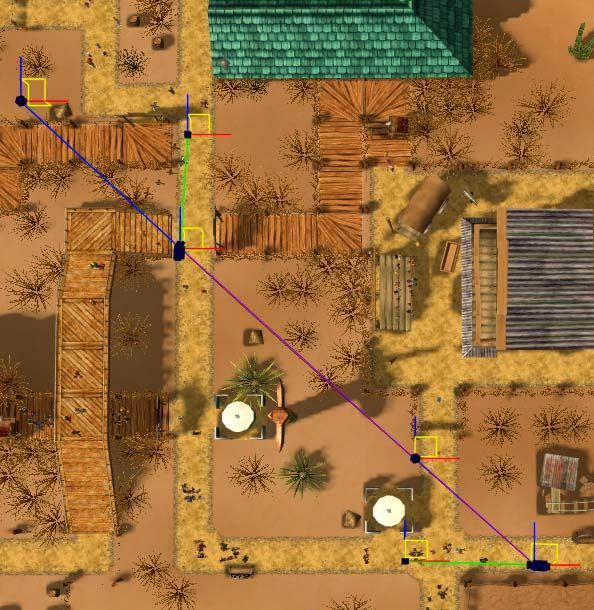 When you start creating camera routes a number of markers will appear in the main game screen. The Movement Direction Marker shows the direction in which the camera is travelling at that point on the route, while the View Direction Marker shows which way the camera is looking. Don’t worry too much about all these controls right now. As we go through the tutorials they’ll make more sense. I’m going to use the ‘Money Pit’ scenario for this tutorial so the scenery in the screenshots will look familiar. I’ll be skimming over some features, but you’ll find more detail about them in later sections of this guide. Start up the Money Pit scenario and for now let’s just use the usual ‘Advanced’ control mode. The FCR Editor will work with the other viewing modes too. ‘Freelook’ can be very useful, if a little tricky to master, so I’ll cover it later on. Bring up the Editor by pressing CTRL+SHIFT+0, then click the New Route drop shadow to reveal the rest of the controls. A default view will appear in the mini preview window, probably from a vantage point underground. Just ignore it. Let’s add one more camera position. Continue moving forward and down until you are near the castle on the other side of the low hills. Click the ‘E’ button in the Editor’s window again to add this camera position to the end of the route. If you’ve used other animation or video editing software before, these camera positions are kind of like ‘key frames’. Before testing the route, let’s adjust the overall speed with the red vertical slider. Initially it will be set at its slowest speed. Click just a tiny bit above that to make it go much faster. Click the Play button to see your route unfold in the mini preview window. Woot! Our first camera route! Let’s watch it again, but full screen. Check the Full Screen Preview box, then hit Play again. When it’s finished, don’t forget to uncheck the box so we’re back to the usual viewpoint. Want to preview the route without any interface windows or buttons? Click the Solo Play button. Always remember to uncheck that Full Screen Preview box when finished or you’ll be wondering why the heck you can’t move your viewpoint. Yup, I’ve done that many times. To check what the camera will see at any given moment, click on the timeline at that spot. In fact, you can even click-and-drag with the left mouse button to ‘scrub’ back and forth through your camera route. Let’s fine-tune the view at the second camera position. When making these sorts of adjustments, you’ll be working on the main screen so you can see the camera markers, but keeping an eye on the mini preview window to the results of your adjustments. Click on the on the timeline just above the second camera position icon. The mini preview window shows you what the camera sees at that moment. Now back up and adjust your view in the main screen so you are looking sideways at that second camera marker. Adjust the size of the markers with the blue slider so you can see them clearly. 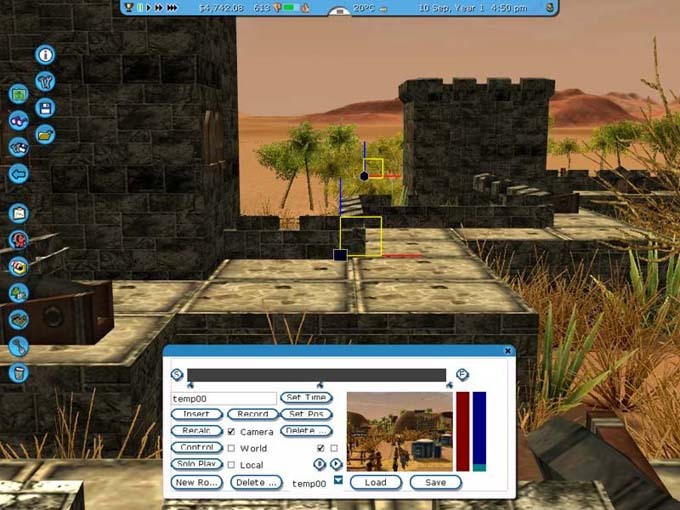 There are two control markers attached to the camera. One controls the direction in which the camera is moving (blue line), the other controls where the camera is looking (green line). So yes, you can have the camera looking in a different direction than it is traveling. Lots of creative possibilities. You’ll see some axis control widgets sticking out of each marker. There are three different styles for these widgets, for now we’ll just use the default ‘Camera’ mode. Details about the other modes can be found in a later section of this guide. To move the camera up and down, move your cursor into the yellow square until it becomes highlighted, then click and drag it. I’m going to raise the camera a bit. You’ll see the purple camera route move with it, and the mini preview window will change. To change where the camera is looking, we’ll move the marker at the end of the green line. Grab the yellow square axis widget for the marker (make sure it’s highlighted) and drag it. I’m moving mine so the camera looks down towards the ground as it flies over the hill. Now try playing the route again in the mini preview window to check out the changes you made. If you’ve moved it backwards or forwards as well as up, you may find the camera seems to slow down or speed up a certain points. This is caused by the differing amount of distance between camera positions. You can try to fix this by grabbing the camera position icons below the timeline and sliding them back and forth. Or let the program fix it for you. Click the Recalculation button and it will adjust the timing in an attempt to keep a consistent camera speed. Of course, you may want to keep the varying speeds for specific dramatic effects. Another automated aid is the Control button. It will adjust the control markers for the cameras to try and smooth out its movement. Sometimes it’s a big help, sometimes not. OK, enough fiddling, let’s make a video clip already! Hang on just a moment, for safety’s sake let’s save our camera route first, just in case. Click the Save button, type in a filename for the route, and click the little disk button. These ‘.fcr’ files are saved in the main folder where RCT3 was installed. Finally it’s time to hit that Record button. Just like video capturing from a CoasterCam, this is a slow frame-by-frame process but it gives very good quality results. One annoying thing: when it reaches the end of the camera route, the FCR Editor’s window reappears, but it doesn’t stop recording! Use the CTRL+SHIFT+F11 key combo to stop it. Now you can go to your ‘My Documents\My Videos\RCT3\’ folder to find the resulting video clip. 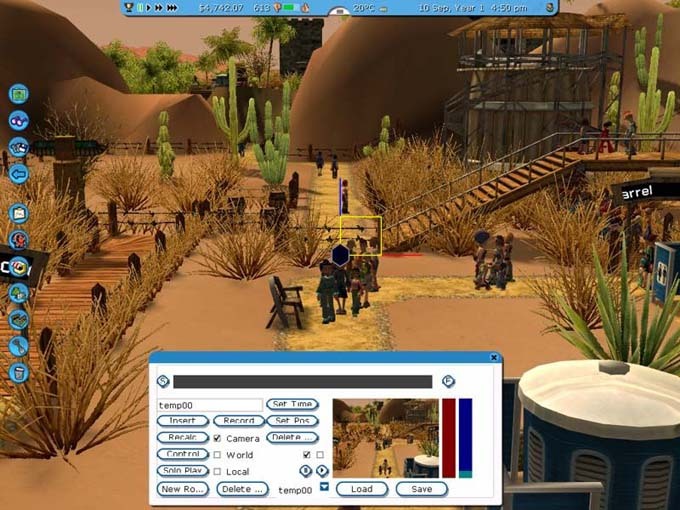 Double-click on it to play the clip in Windows Media Player or whatever viewer program you use on your computer. That’s the basics of creating a straight-line flying camera route and using it to record a video clip. You can see that there are many interesting shots you can get just with this simple example. But suppose you want the camera to move in a curved path around a corner? That’s the subject of our next tutorial. I’m going to use the Money Pit scenario again for this tutorial. Bring up the FCR Editor window and start a new route. If you’ve still got the Editor window open from our previous tutorial, just click the New Route button’s drop shadow to clear the last route and begin a new one. When creating a curved route in the FCR Editor, you are setting points (camera positions) and the Editor attempts to calculate a smooth Bezier-type curve (route) through those points taking into consideration the direction of travel and which way the camera is pointing. In other words, it does a certain amount of guessing about your intentions. Sometimes those guesses work out, sometimes not. When the result is not quite right, you’ll have to adjust the control handles (markers) manually. That’s what this tutorial will focus on. We’re going to create a route curving around a 90-degree corner. The only camera positions we really need are the start and finish of the curve. Generally speaking, the fewer camera positions the better. More positions may let the program make better guesses about the curve you want, but it also means more chances that the camera will ‘bobble’ at an intermediate position. Learning how to use the markers to adjust the route is ultimately much easier than creating a ton of points all along the curve. Enough talk, let’s roll! Move your view close to where we started last time, above the path near the washroom facilities. Click the ‘S’ button to set the start of our camera route. Now rotate and move your view so you’re looking up the path heading towards the western wheel. Click the ‘E’ button to add that position to the end of the route. The camera position icons will appear on the timeline. Click the Play button to see our route in the mini preview window. What the ??? That sure isn’t the nice smooth curve we wanted! Let’s see what the FCR Editor calculated for us by adjusting our view so we’re directly above the route, looking down at it. Now you can see why the preview was so wonky. The route is a straight line from the start position to the end, with only the direction of the camera view changing. Time to adjust some markers. Look at the end camera position. The marker at the end of the blue line controls the direction the camera is moving at that point, and therefore influences the curve needed to reach that direction. It’s sticking off at a weird angle; we want the direction to be following the path. Grab the yellow box attached to the marker and drag it over so it’s aligned with the path. Notice how that part of the route is now curved, but we can now see that the movement direction marker for the starting camera position also needs to be adjusted. 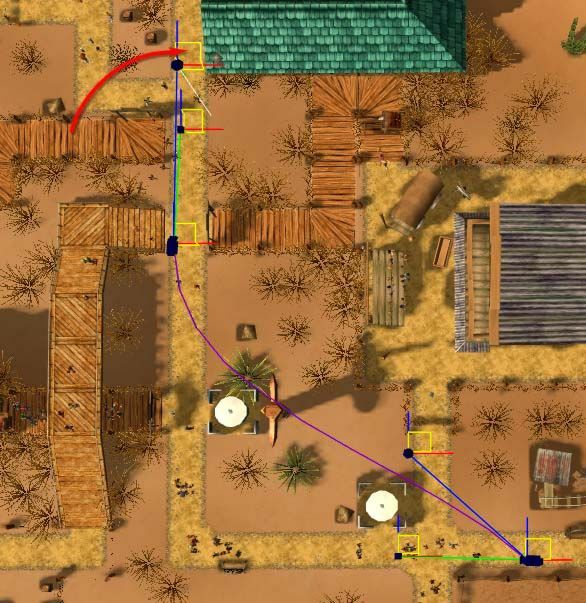 We want the camera to initially travel down the first path before turning, so that position’s movment direction marker should be aligned with the path. Grab the yellow box of the marker at the end of blue line and move it down to match up with path. That’s much closer to what we wanted, it’s now a nice smooth curve. Play the preview to see the improvement. Not bad, but it turns in too soon, so we end up flying over the toilet facilities. You can adjust how shallow or deep the curve is by dragging the movement direction markers closer or farther away from the camera position. Grab the yellow box on the end of each movement direction marker and stretch it out away from the camera. The curve is now wider, missing the infamous facilities. Now try playing the preview again. Much better! When you create more complicated routes with multiple curves, you may find you have to adjust the direction markers for several camera positions to make the curve look right. You might even have to move the camera position itself to make a smooth flowing curve. When fiddling with these, sometimes their position may end up too high or low, or the camera may end up looking too far up or down. To adjust this, swing your viewpoint down and around so you’re looking at the route sideways, then grab and move the markers. Remember that you can set the timeline so it’s at a specific camera position, which lets you keep an eye on the mini preview window to see the effects of any adjustments. In both tutorials we created the sequence of camera positions in the most ‘natural’ way, working from start to end. But you can also build up a route by working backwards. This is most useful when you want to camera to zoom down into a specific spot. To do this, move your view to where you want the camera to end up. Click the ‘E’ button to set the end of the route. Now back up to the ‘previous’ camera position, the one before it reaches the end. Click the ‘S’ button to add this camera position to the start of the route. Back up some more and add that position to the start of the route. When you preview the route, you’ll see it will travel from the last position you added (the start) towards the first one created (the end). If you toss in a few curves along the way, you may notice that the FCR Editor seems to be able to calculate the proper curve between camera positions a bit better when flying in reverse. But you’ll probably still have to fiddle with the direction markers to make it come out right, so that’s why the second tutorial focused on that feature. In the tutorials I used the usual ‘Advanced’ control mode for the camera since that’s what most people are used to. But when you’re setting up camera positions, especially in tight quarters, the ‘Freelook’ mode is very handy because it handles rotation differently. It also allows you to tilt the view further upwards than you could do otherwise, and there is a difference in the field of view. Advanced mode gives a fairly standard, natural view, like a 50mm lens on an SLR camera. By comparison, Freelook mode gives a more wide-angle view. Both are handy. I’ve used the Advanced mode view to compress the distance from an object in the foreground to others in the background, and used the Freelook wide-angle to capture more of a building interior in a shot, or to exaggerate the distance from a foreground object to the background. When you’re planning shots, consider what would be most appropriate for the feeling you’re trying to convey. - Middle mouse button: click-and-drag to move forward/back or left/right. - Right mouse button: click-and-drag to rotate/tilt your view. - W-A-S-D keys to move forward-left-backward-right. - The cursor keys also move the view in the same way. - Page Up to move the view straight up. - Page Down to move the view straight down. Notice how the rotation differs when using this control mode. You are rotating the view around as if you are holding the camera. The other control modes rotate around a point in the scenery up ahead of you. (exactly which point depends on some other options you can select) When fine-tuning the viewing direction for a particular camera position, I prefer to use the Freelook mode. Each camera position along the route has three markers. There’s one for the camera itself and two others attached to it. One of these, at the end of blue line, shows the direction of travel of the camera at that point. The other, at the end of a green line, shows which way the camera is looking. Each of these markers has a set of axis adjustment ‘widgets’ used to move them along one specific axis or across a plane (two axes). As you move the cursor over the widgets, they will become highlighted. Click-and-drag at that point to move along the highlighted axis, or across the highlighted plane. If you’ve ever used 3DStudio Max, you’ll feel right at home - it’s a very similar control scheme. There are three different variations of these axis control widgets: ‘Camera’ (the default), ‘World’, and ‘Local’. They present the coordinate system in different ways, sometimes making it easier to make a particular adjustment, sometimes seeming only to make things confusing. The ‘World’ mode aligns the coordinate widgets with the 3D world of your park. Personally, this is my preferred control mode. I know that no matter what angle I’m looking at a marker, grabbing a specific plane or axis will move it in the same manner as the last time I used it, even if that was from a completely different perspective. The ‘Local’ mode aligns the coordinate widgets to the orientation of the marker itself. For example, if the camera is pointed down, then the coordinate system will oriented that way too. It’s handy for that exactly that sort of situation, where the view from a camera position looks great, but you just want to pull the camera back a touch or push it in closer. Creates a camera position at the current location in the main screen and adds it to the Start of the route. Technically, it doesn’t much matter whether the very first camera added to a route is created by pressing the ‘S’ button or the ‘E’ button, but of course they do affect how the subsequent positions are added to it. ‘S’ puts them at the start of the timeline, ‘E’ puts them at the end. Shows the relative timing between camera positions, a grey bar shows progress through those positions as a route is previewed. Click on it to specify a particular spot as the ‘current’ time and to preview what the camera sees at that point. 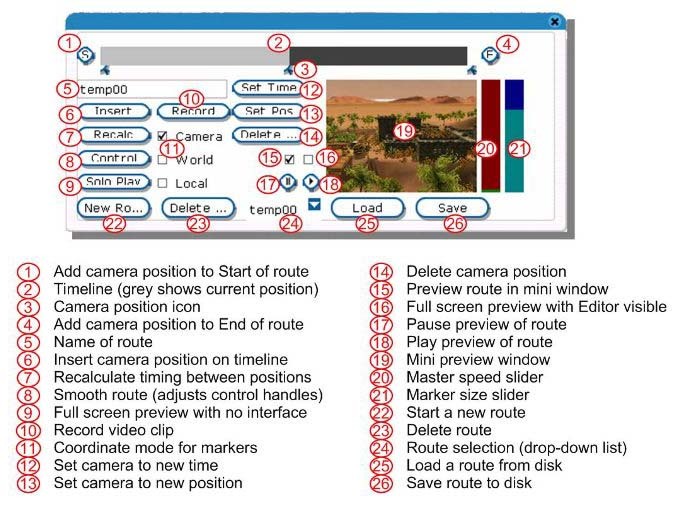 Click-and-drag to ‘scrub’ back and forth through the camera route. Represent the camera positions you’ve set along the route. You can click to select one for various operations (e.g. deleting), but there’s no indication that it is selected. One can also click-and-drag to adjust timing from one position to the next. Looks like an ‘F’ since the bottom of the letter is cut off. 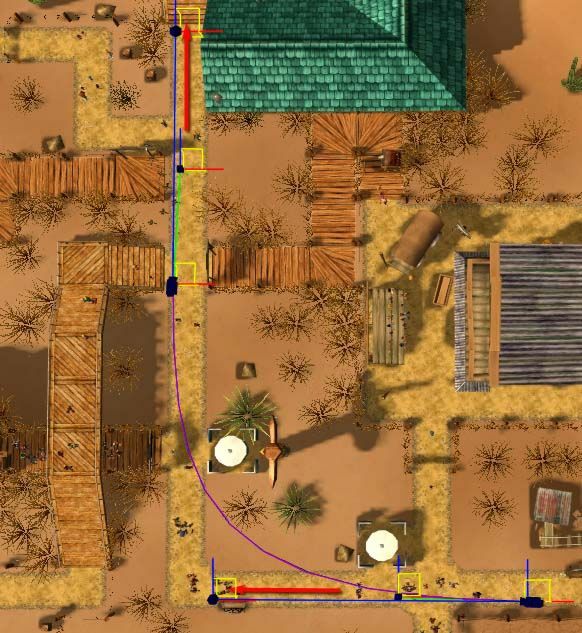 Creates a camera position at the current location in the main screen and adds it to the End of the route. You can name the route you’re working on. These names show up in the Route Selector Drop-down List described below (#24). This name seems to be saved in the .fcr file, since a reloaded route has its name appear in that drop-down list. Set up a view in the main screen, set the current time on the timeline to the place where you want that camera position to appear, then click the Insert button. 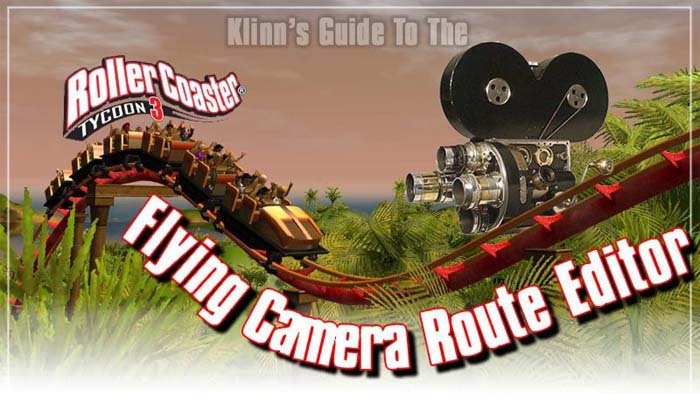 Adjusts the spacing between all camera position icons on the timeline so that the camera will move at a consistent speed throughout the whole route. Often changes the effective scale of the Master Speed Slider (the red one) so you have to readjust it to get back to your route’s original speed. 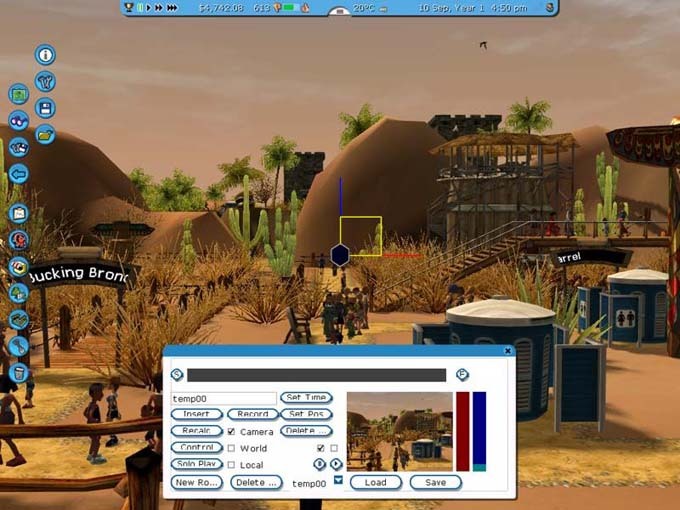 Adjusts the movement direction markers for each camera position to try and smooth out the motion of the camera. Sometimes makes large changes, sometimes seems to have only a limited effect. Provides the most accurate preview of how the movie clip will turn out. Gives a full screen preview with no overlaid interface controls. You can get a much better sense of the speed of your route when previewing it full-screen. When the preview is finished, don’t forget to uncheck the ‘Full Screen Preview’ box (#16) before continuing to work on your route. Starts a slow but high quality frame-by-frame recording of your camera route. When the route is finished, the Editor’s controls reappear but it still keeps recording. Use the CTRL+SHIFT+F11 key combo to stop recording, or to interrupt the process. Aligns the widgets' coordinate system in one of three different ways. Please see the ‘Tweaking Camera Markers’ section above for more details. OK, I’m still stumped by this one. If you have a route with three camera positions (start, middle, end), click on the timeline to set the current time and then click this button, the difference between the current time and the middle camera position is averaged. Both move and end up in the same spot inbetween. If you have a route with four camera positions, both intermediate positions move but by different amounts. I’m not quite sure what this is trying to accomplish - you’re on your own with this one! Set up a view in the main screen, select a camera icon below the timeline, then click the Set Position button. The selected camera is relocated from its old spot to the location in the main screen. This may sometimes be quicker than dragging a camera marker all over the place with the axis adjustment widgets. Select a camera position icon below the timeline, then click the Delete button to get rid of that camera position. You must click on the button’s drop shadow. When selected, the preview of a route is displayed in the mini window just to the right. When selected, the preview is displayed full-screen. Unlike the Solo Play button, this one keeps the FCR Editor’s interface visible as the preview unfolds. When the route is finished, don’t forget to uncheck this box before trying to continue working on your route. While previewing a route, use this to pause. Starts a preview of the flying camera route, which may appear in the mini preview window and/or full-screen, depending on the how you’ve set the checkboxes just above. When adjusting camera and direction markers in the main screen, set the current spot in the timeline to correspond to the camera you are adjusting. Then you’ll be able to immediately see the results of the changes in this window. Initially set to the slowest possible speed, nudge this up just a tiny bit to increase the overall speed of the route. If you use the Recalculate button, you’ll probably have to change this again to get back to the original speed of the route. If you are zoomed back from a camera position in the main screen it can be hard to see its markers. Adjust this slider to make them bigger. Click to begin a new route. You must click on the drop shadow, not the button itself. If you have another route open at the time, it is discarded. However, the previous route is still in memory and can be brought back by using the Route Selector Drop-Down List described below. You guessed it, deletes the current route. Another button that can only be activated by clicking on its drop shadow. As you create a route, you can name it in the Route Name box mentioned above. If you start a second route, you can get back to the first one by selecting it from the drop-down list. Note that if you don’t give routes distinctive names, they will all look the same on the list! You’ll see a lot of Temp00’s, the default route name. When re-loading a route from disk, this route name appears in the list, not the filename. Loads a previously-saved route (.fcr file). Saves the current route as a .fcr file in the game’s main installation folder. I tend to use the Route Name as the filename, just to keep things easy to remember.